Let GoReminders keep track of when to send a text message reminder to your customers. Then you can relax and be ready for when customers show up. Text reminder (also txt reminder) [noun]: an electronic SMS reminder text message sent to a mobile phone that causes someone to remember something; often used instead of a phone call reminder. "GoReminders software automatically sends each of customer a text reminder before an appointment so you can focus on your work." GoReminders is the easiest way to get started with automatic text message reminder notifications for your clients. 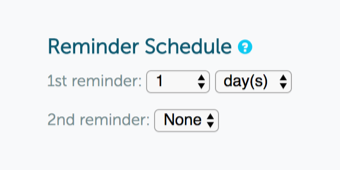 You can schedule your appointments a month in advance or a day before, and GoReminders is smart enough to know when to send text appointment reminders to your clients. Text reminders are by far the most popular customer reminder method among GoReminders remind text service users. 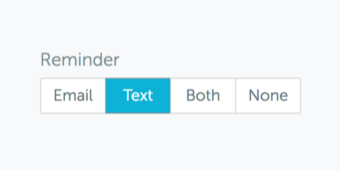 The other options are Email, Both Text & Email, and None. You can decide on the reminder method based on what each customer wants, and our email (yes, GoReminders is also an email reminder service) & text reminder system will remember that choice so it’s less work for you. This is the easiest-to-use calendar reminders app that's always updated to save you time. A recent study at the University of Kentucky about text message appointment reminders and reducing no-shows found that "Cost-benefit analysis yielded a potential 1:6 return.” Just from text messaging reminders. That’s a 6X return on investment – simply by using a business text messaging service! For example, if you take our $20/month plan, a 6X return would mean an extra $1,440 in money you made over the year. Many of our users find that GoReminders saves them even more money than that when sending reminder texts. We think the ROI is even better than 6X for GoReminders users because we make it so inexpensive to send text reminders. When we did a survey, the average amount of revenue saved was an astounding $27,404 per year. That seems crazy at first glance, but the amount of money lost by no-show and no-call appointments is much larger than it seems. It’s like watching a leaky faucet – it seems like just a trickle, but if you plug the drain (or check your water bill) you’ll quickly see how much it builds up. Text reminders are easy for having your clients confirm appointments. They just reply "C" to confirm and the appointment will show a check mark in the calendar! GoReminders also support multilingual text reminders in any language and recurring text reminders. Use the GoReminders text message reminder system for your appointment book, and never worry about remembering to send text message reminders to a customer – your phone doesn’t even need to be on. That saves you time & makes you money. Try it free to see the beautiful simplicity of our auto text reminder service. Literally 10 seconds to get setup and you’ll be entering appointments – fastest and best text reminder app.